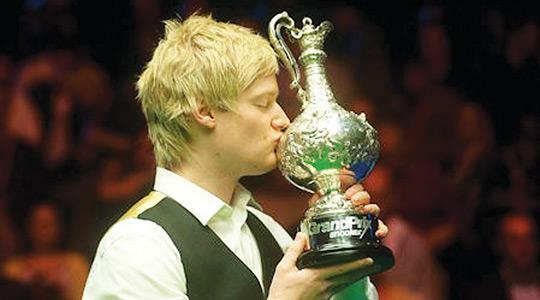 Neil Robertson with the Grand Prix trophy. Neil Robertson won his second Grand Prix title after Ding Junhui capitulated in Sunday night's final at Glasgow's Kelvin Hall. Australian Robertson, 27, completed a 9-4 victory to claim his fourth ranking title, making him the most successful player from outside the British isles in the history of the game. Ding twice came from behind to level at 4-4 at the start of the evening session. The Chinese star, 22, had staged comebacks in three of his four matches on the way to the final, but he never recovered from losing an epic ninth frame, which lasted for almost an hour. The match was only the second of the sport's 220 ranking finals to be contested by two non-Britons, the last being 24 years ago. Neither player had lost the final of a ranking event before but it was Robertson who emerged with that record intact. Fresh from his final-black victory over world champion John Higgins - hailed as one of the finest matches in the tournament's history - Robertson could not have dreamed of a better start as he potted everything in sight on his way to a 124 clearance. But, the final frame of the session proved dramatic. Ding was unfortunate to knock in a red splitting the pack off the blue before Robertson miscued horribly when in among the balls. But the Australian - now third in the provisional world rankings - did not waste his next chance, compiling a 43 break to go back in front 4-3. Despite missing the easiest of yellows, runs of 48 and 47 helped Ding level again as the evening session got under way. The Chinese then almost came from 50 points down to steal a gruelling 57-minute ninth frame after getting a snooker but Robertson held on. The malaise persisted until Robertson managed a 36 break to move two ahead before two easy missed reds from his opponent and a run of 46 helped him into a 7-4 lead at the interval. Ding's game continued to disintegrate and he was unable to hide his frustration when he fluffed a simple pink to the middle to hand Robertson a dour frame 12. And he broke down again in the next, Robertson punishing him with a break of 89 to wrap up victory.